Comfortable and well presented detached villa for sale in Mojacar Playa Costa Almeria Andalusia. 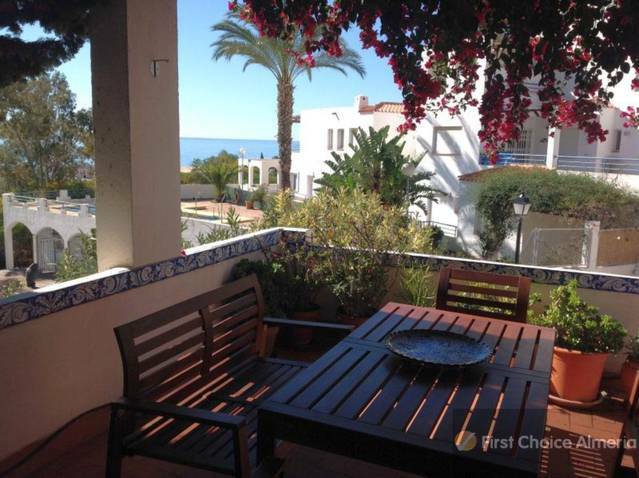 The property is located in the popular and quiet residential area of El Palmeral and is only approx 500m/6 minute walk down to the beach and all amenities. Ground floor: Entrance hall, lounge with open fire place, dining area, sun lounge, fully fitted kitchen, laundry room, cloakroom, main double bedroom and ensuite bathroom with walk in shower. First floor: 2 double bedrooms, bathroom with jacuzzi bath having step-in easy entrance. The upstairs terrace has been covered in and makes a nice extra sitting room / 4th bedroom. Terrace with jacuzzi and views to the sea. Various outside seating areas with beautiful gardens. The villa is South East facing so enjoys all day sunshine. Sold with fixtures and fittings.